S&P futures are higher, maintaining overnight gains as most Asian markets advance with the MSCI Asia Pacific index 0.5% higher, as sentiment was boosted by President Trump unexpected reversal on China telecom giant ZTE over the weekend when in a Sunday morning tweet, Trump vowed to get the Chinese telco back to business in a surprising policy U-turn after the company announced a halt to major operating activities following a US 7-year supply ban order. Europe was broadly, if modestly, in the red as a result of the EUR rising to session highs just shy of 1.20, the highest in over a week, after the ECB's Villeroy said the first rate hike could come quarters, not years after the end of asset purchases, while political strains in Italy outweighed optimism over waning global trade tensions. Thanks to the weaker dollar, emerging-market stocks built on their first weekly advance in four weeks. Elsewhere in Asia, Malaysia’s markets showed only short-lived post-election panic, with the ringgit rebounding from 1% drop while stocks in Kuala Lumpur recover opening losses to gain 0.5% as trade returns after a historic election loss by the ruling Razal-led coalition, its first in over 60 years. Also in Asia, the PBOC conducted a 156BN yuan MLF operation to boost liquidity helping H shares rally 1.5%. And speaking of China, the onshore yuan surged the most in almost three weeks against the trade-weighted basket of currencies, as the central bank boosted its daily reference rate for a second day, pushing up the yuan fixing by 0.28% to 6.3345 per dollar, extending the two-day increase to 0.66%. The Bloomberg replica of the CFETS RMB Index, which tracks the yuan against 24 exchange rates, jumped 0.18%, the most since April 24, to 97.77; According to Bloomberg that was the highest level since China adjusted the basket in Jan. 2017. Emerging markets currencies were stronger as the Bloomberg dollar index softened marginally, with the euro and pound rising to the top of G-10 scoreboard. The Bloomberg Dollar Spot Index fell 0.2% to hover near Friday’s one-week low. The euro gained 0.4% to touch $1.1990, the strongest in more than a week, while sterling gained as much as 0.4% to $1.3597 after advancing 0.2% on Friday. The Swiss franc climbed 0.1% to $0.9992, staying close to Friday’s one- week high. Treasuries are weaker, with the firmer with 10-year yield rising from 2.96% at the European open to a session high of 2.985%, while Australian and Japanese government bonds grind sideways. European bonds edge higher after ECB’s Villeroy says the first rate hike could come “some quarters, but not years,” after policy makers end their bond-buying program. While the EUR strengthened, there was some modest selling for Italian government bonds following late Sunday's news that the 5-Star and League have reached an agreement on forming the first anti-establishment government, although so far the move remains largely contained and is far less troubling than the capitulation some had expected with Italy faced with a populist coalition. In a curious rate arb move, Bloomberg reports that the U.K.’s biggest bond-mutual fund is shifting money to the other side of the Atlantic as the interest-rate gap between Europe and the U.S. widens to record levels. M&G Ltd. has boosted U.S. holdings in its 23.4 billion-pound ($32 billion) Optimal Income Fund this year to more than a third. To cushion inflation risks and the impact of rising U.S. rates, it’s gorging on short-term Treasury bills and paring credit risk. In geopolitical updates, Iranian foreign minister Zarif said he had good meetings with China and Russian counterparts, adding they will soon determine how nations can guarantee Iran’s benefit under the nuclear deal. As reported over the weekend, North Korea is planning to take apart its nuclear test site during a ceremony to be held between May 23rd-25th, while there were also comments from US Secretary of State Pompeo that North Korea sanctions will be lifted if the nation proceeds with total denuclearizarion of the Korean peninsula. In central bank news, Fed's Mester (Voter, Hawk) said she doesn’t expect inflation to pick up sharply and she supports gradual rise in US interest rates and adds she does not expect to hike rates beyond 3% in the near future. Earlier, ECB's Villeroy (Dovish) said the end of net asset purchases is nearing, but whether this is in September of December is not an existential question, adding that communication will be adjusted given current rate guidance is conditioned on the end of net asset purchases, could give additional guidance on timing of rate hike - "well past" seeming some quarters rather than years. He believes underlying inflation is set to strengthen irrespective of short-run fluctuations in energy inflation, sees the current slowdown in inflation as temporary and expects it to resume its progress in the coming months. Also overnight, Norges bank Governor Olsen reiterates outlook shows it will be the right time to hike key interest rates soon; adding that their latest analyses presented in March 2018 suggest that the key interest rate will likely be raised after summer 2018. It's a quiet day, with the only expected data including mortgage delinquencies and foreclosures. Agilent, Invitation Homes, and Vipshop are among companies reporting earnings. ECB Executive Board member Sabine Lautenschlaeger, chief economist Peter Praet, Executive Board member Benoit Coeure speak. earnings remained in focus with Shiseido among the index leaders on record Q1 sales. Shanghai Comp. 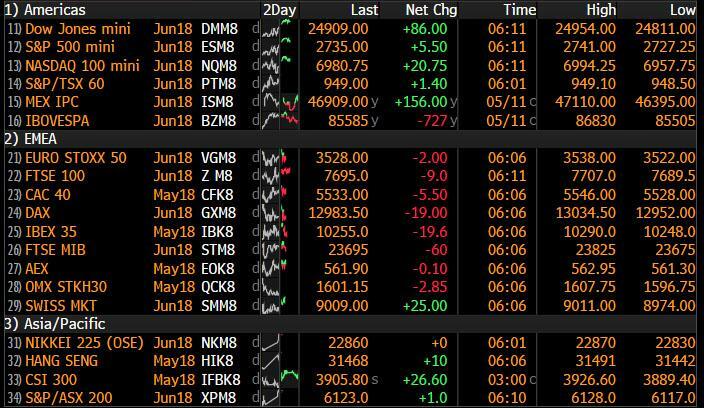 (+0.3%) and Hang Seng (+1.4%) conformed to the broad risk appetite as trade concerns eased following the ZTE policy reversal by Trump and as participants also reacted to better than expected lending data. Elsewhere, KLCI (+0.4%) saw an early slump with losses of over 2% on reopen from the surprise election result, but then pared all the weakness as the fears of a new government gradually subsided. Finally, 10yr JGBs were flat amid similar price action in T-notes and with demand sapped amid gains in stocks, while downside was also counterbalanced by the BoJ’s presence in the market for a respectable JPY 1.03tln of JGBs in 1yr-10yr maturities. US President Trump said he instructed the US Commerce Department to assist Chinese telecoms firm ZTE to get back into business which is seen as a U-turn on the firm which was previously placed under a 7-year supply ban by the US. European equities are currently trading with no firm directions (Euro Stoxx 50 -0.1%) with the SMI the outperforming bourse (+0.3%) aided by Novartis (+0.8%) and Roche (+1.2%) both receiving positive news from the FDA pertaining to drug expansions. The modestly underperforming bourse is currently the FTSE MIB (-0.5%) with traders mindful of upcoming developments on the Italian Government formation. The automotive sector is being weighed on following the US proposition of 20% tariffs of foreign cars imported to the US. Further effects in European equities from US actions has seen the healthcare sector showing positivity in the wake of the Trump administration releasing a (vague) blueprint for drug pricing; and Ericsson and Nokia down on Trump’s tweet that he will help the penalized ZTE. In stock specifics, strength is being seen for IWG (+21.2%) on the news that the co. has received separate takeover proposals from private equity groups Starwood, Lone Star and TDR Capital, raising prospects of a bidding war. In FX, the biggest DXY currency components are leading broad gains vs the Dollar on a combination of supportive fundamentals (relatively hawkish rhetoric from ECB’s Villeroy and further progress towards an Italian coalition Government in the case of the single currency), and a more positive technical landscape after recent sharp declines. It appears that Eur/Usd and Cable have both formed fairly solid bases circa 1.1820 and 1.3460 respectively, and dip-buyers/fresh longs are looking for extended recoveries towards 1.2000 and 1.3600 with stops said to be poised around 1.1980 and 1.3610. Market contacts also note that chart resistance in Eur/Jpy has been breached at 130.86, with bulls eyeing a 50% Fib next (131.86 vs 131.20 top so far). CAD/AUD/CHF: All mildly firmer vs the aforementioned depressed Greenback overall (index still sub-92.500), with the Loonie still benefiting from latest NAFTA reports suggesting a deal could be forthcoming by Thursday and Usd/Cad retesting bids/support ahead of 1.2750. Aud/Usd is maintaining recovery momentum around 0.7550 amidst less against on the global trade front after US President Trump’s volte-face on China’s ZTE, and with cross Aud/Nzd also a prop (over 1.0850 and edging towards the 200 DMA at 108.81). Usd/Chf is holding just below parity, prompting more pledges from the SNB to keep rates negative and active in terms of direct FX intervention to curb Franc demand/appreciation. NZD/JPY: The G10/major laggards and bucking the overall trend with losses vs the Usd, albeit modest, as the Kiwi hovers near 0.6950 and Usd/Jpy rebounds from the low 109.00 area to 109.50. In commdities, oil prices are lower, subdued on continued profit taking with WTI crude below the USD 71.00/bbl level, while some reports also noting increased efforts by European nations to salvage the Iranian nuclear deal and will be meeting with Iranian Foreign Minister Zarif tomorrow. Elsewhere, gold trades flat with marginal gains observed on the back of a subdued USD, while copper (-0.5%) is lower amid reports Japanese miners plan to boost Chilean copper output this year. Aluminium prices eased for a third session as markets continue to correct following the rally last month supported by US sanctions against Rusal. Meanwhile, Chinese iron ore prices extended gains, supported by a firm demand outlook and a decline in the metal’s inventories at ports. At first glance the week looks a bit less hectic than my weekend with the US retail sales number and the monthly China data dump tomorrow being the data highlights. We do have a busy Fedspeak calendar though and expect a lot of focus on the recent slightly weaker-than-expected inflation numbers. Meanwhile trade talks might come back to the fore with China's Vice Premier traveling to Washington to continue talks with Treasury Secretary Steven Mnuchin. There's also a few Brexit meetings to flag and Iran, North Korea and the Oil price will no doubt stay on the radar. The full week ahead preview is at the end today. We start this morning with Italy, where we seem to be inching closer to a new government. The leaders from the two largest parties are expected to meet the head of state later today and “report back on everything” they had negotiated over the weekend. Earlier, La Repubblica reported that the Leaders of the 5SM (Luigi Di Maio) and League party (Matteo Salvini) have decided that neither should be Premier of the new government, but did not elaborate on a potential candidate. According to Bloomberg and newspaper Repubblica, measures agreed in a draft government program include: a citizen’s income for the poor, a flat tax at 15% (20% for higher earners), renegotiating EU accords and complying with EU limits on public spending. However, there are no details on how they will fund these proposals but at first glance this seems like a lot of potential spending promises. Now turning to other headlines over the weekend. On trade, President Trump seemed to partly reverse the sanctions on China’s number 2 telco company (ZTE) as he and China’s President Xi are working together to give ZTE “a way to get back into business, fast”. He added that the “(US) Commerce Department has been instructed to get it done”. In geopolitics, North Korea said it will dismantle its nuclear test sites within two weeks and invited international journalists to watch. On the other side, the US National Security adviser Bolton said “we’re prepared to open the trade and investment with North Korea as soon as we can” while the Secretary of State Pompeo noted that NK will have access to US capital if “complete, verifiable, irreversible denuclearisation” occurs. Then finally on Iran, Security adviser Mr Bolton warned that US sanctions on European companies that continue to maintain business dealings with Iran were “possible”, while Mr Pompeo was hopeful that the US and its allies can strike a new nuclear deal with Iran. This morning in Asia, markets are broadly higher, with the Hang Seng (+1.28%), Nikkei (+0.40%) and Shanghai Comp. (+0.55%) all up while the Kospi is slightly lower. Elsewhere, the Malaysian ringgit pared back losses to be broadly flat vs. the USD as markets resumed trading following Mahathir’s historic election victory last week. Datawise, Japan’s April PPI eased 0.1ppt mom to an in line print of 2.0% yoy. Now briefly recapping markets from Friday. The Stoxx 600 edged up +0.11% while the S&P rose +0.17%, supported by the telco sector as Verizon jumped 3.0% after announcing a buyback of its debt securities. In government bonds, core 10y bond yields were slightly higher (UST +0.8bp; Bunds +0.2bp; Gilts +1.2bp) while peripherals outperformed. The yield on 10y Italian BTPs fell -6.3bp, reversing its prior losses on Thursday. In FX, the US dollar index was marginally higher (+0.02%), while the Euro and Sterling rose 0.23% and 0.17% respectively. Lastly, WTI oil fell for the first time in three days (-0.92% to $70.70/bbl) and precious metals softened slightly (Gold -0.17%; Silver -0.31%) while other base metals were little changed. Now turning to the Fed Bullard’s views on the yield curve. He noted that “…the yield curve inversion is getting close to crunch time” and that we “could be talking about it in September”, although he does not think it’s likely to happen that fast, but it will be an issue next year. On inflation, he said “we’re not in any danger of any breakout in inflation any time over the forecast horizon” and he basically has “no problem with some overshooting of the (2%) target”. On rates, he believes the Fed does not need to raise rates further, in part as rates have reached its neutral setting and “it’s not necessary to change the policy rate to keep inflation at target”. Ahead of more Brexit talks this week, the UK’s PM May wrote in the Sunday Times newspaper to reiterate her calls for unity over Brexit, she noted that “you can trust me to deliver….the path I’m setting out is the path to deliver the Brexit people voted for”. So lots bubbling along until we get more clarity on the issue. Before we take a look at this week’s calendar, we wrap up with other data releases from Friday. In the US, the May University of Michigan consumer sentiment index was steady mom and slightly above consensus at 98.8 (vs. 98.3 expected). In the details, the current conditions index edged down 1.6pts mom to 113.3, while the expectations index firmed 1.1pts mom to 89.5. The 1y inflation expectation edged up 0.1ppt mom to 2.8% while the 5-10y inflation expectation was steady mom at 2.5%. Elsewhere, import prices rose 0.3% mom in April while exports grew 0.6% mom. Following the above, the NY Fed’s Nowcast measure of Q2 GDP growth ended the week unchanged at 3.0% saar, while the Atlanta Fed estimate is 4.0% saar. In Europe, the final reading of Spain’s April inflation was unrevised at 1.1% yoy. On Monday's Calendar, central bank speak will be the focus of today with the Fed's Mester and ECB's Villeroy both speaking in the morning in Paris, followed by the ECB's Lautenschlaeger, Praet and Coeure later in the day. Brexit developments could also come back to the forefront with the EU's Barnier due to brief European affairs ministers on the status of talks. Datawise the only release of note is the Bank of France industry sentiment print for April. Senior officials from Euro area finance ministries are also due to meet to discuss the latest Greek bailout review.